The African National Congress (ANC) which has ruled South Africa since the end of apartheid in 1994 is once again in crisis. The President, Zuma, faced a no-confidence vote on 18 April but because the opposition parties demanded the vote be conducted by secret ballot the issue has been referred to the constitutional court so the whole process has been postponed. The reason for demanding a secret ballot is that many of the ANC MPs see Zuma as a liability and a threat to the ANC. They might vote against him in a secret ballot but fear to vote against him openly. Such open defiance would forfeit their chances to keep their snouts in the state trough which provides rich morsels in the form of rake-offs on government contracts, business opportunities and chances for promotion. The immediate background to the present crisis was Zuma’s firing of the finance minister Pravin Gordhan. 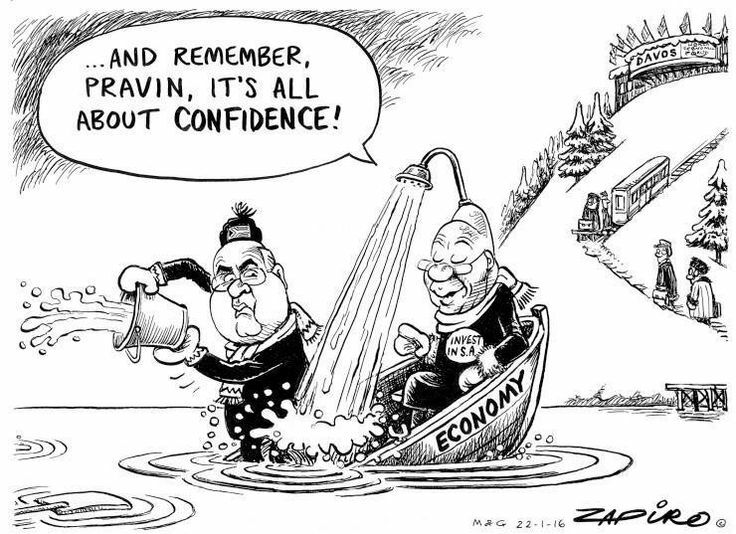 Gordhan, was respected by the international capitalist class and his dismissal led to a 16% collapse in the Rand, and the downgrading of SA debt to junk status by 3 of the most important rating agencies. The firing of Gordhan, however, is only the latest move in a longer campaign which Zuma has waged to install a compliant agent in the Treasury. Zuma’s battle with the Treasury first broke out in December 2015 when he sacked the then Finance Minister Nene. Nene, like Gordhan, was also respected by international capital. Zuma replaced him with an unknown placeman Van Rooyen. This produced a collapse in the value of the currency so that within a few days Zuma was forced to climb-down. He sacked Van Rooyen and brought in Gordhan who had previously served a successful term as Finance Minister. The 15 months since his appointment have brought a recovery in the value of the Rand and had prevented SA’s debt being reduced to junk status. The relationship between Zuma and the Treasury has, however, been uneasy. Gordhan stood in the way of Zuma’s plans for issuing massive state contracts for such things a nuclear power plants and government controlled bodies on which there could be fat rake-offs for politicians. Zuma tried to remove Gordhan by, bringing corruption charges against him, however, the charges were so ridiculous that in November the case was dropped. The irony of Zuma trying to pin corruption charges on Gordhan is that Zuma himself has 873 corruption charges against him, which he still has to answer. These manoeuvres, which are widely seen as Zuma’s attempts to loot the Treasury, have brought about a crisis in the SA political class. Since the ANC victory in the 1994 election the control of the country and the class struggle has been managed by a tripartite alliance of the ANC, the South African Communist (so-called) Party (SACP) and the Congress of South African Trade Unions (COSATU). Recent events threaten to further undermine this alliance. Both the SACP and COSATU have called for Zuma to resign. Senior figures in the ANC have also turned against the President. The ANC Secretary General Mantashe called on Zuma to resign, while the Deputy President, Ramaphosa, called the sacking “totally unacceptable.” Senior members of the ANC now see Zuma as a liability who could split the organisation. The ANC has become a patronage machine spawning a web of corruption and thieving, which even by bourgeois standards is spectacular. A prosecutor’s report entitled “State Capture” chronicled how the Gupta family, with whom Zuma is closely connected, have either controlled or attempted to control cabinet appointments or influence ministries in decisions and the issuing of contracts. The Guptas are Indian capitalists who came to SA in the 90s and have made millions out of state contracts through their contacts with the government. The report implied that they had captured the state. Zuma attempted unsuccessfully to prevent the publication of this report. An example of corruption and patronage, which the report describes, is the story of a coal mine which Glencore, the Swiss mining company, was forced to sell to Tegeta, which happens to be owned by the Guptas and Zuma’s son Duduzane. Apparently the mining ministry threatened Glencore with a fine in a dispute over coal prices. Secret meetings were held in Switzerland and eventually the mine was sold to Tegeta. ESCOM, the state controlled electricity generator, which is controlled by the government, sets coal prices, and phone records show a flurry of contacts between the head of ESCOM and the Gupta family at the time of the sale. When banks refused to advance loans to Tegeta ESCOM advanced the company R600m ($45m) in advance payments. The whole operation has been fabulously lucrative for Zuma’s son and the Guptas. Ralph Mathekga, an independent political analyst, says that the Guptas have created a pipeline from a stream of contracts that is so long and complex that the network is now entrenched . An example of attempts to control government appointments which the report details, is how immediately before finance minister Nene’s sacking in December 2015, one of the Gupta brothers offered the post of finance minister to the then Deputy Finance Minister Mcebisi Jonas! To help Jonas make his decision, Gupta offered to deposit R600m ($45m) into his bank account and asked if Jonas had a bag big enough to carry off R600 000 in cash! Jonas refused, and although initially he retained his position as Deputy Finance Minister, he has now been sacked along with Gordhan. Behind all these shenanigans is a dispute between different factions of SA capital. The so-called urban faction which is more closely linked to international capital and the rural faction who wish to use the state and government spending to enrich themselves. This dispute was made clear by Zuma himself who branded Gordhan as an agent of white monopoly capital, and accused him of preventing radical transformation of the economy and a more equitable distribution of wealth. The Zuma faction stands for profligate state spending and self-enrichment of the political class and their hangers-on. This is what Zuma understands as “equitable.” Hence the ANC itself understands the dispute as a quarrel about which type of capitalism to adopt. It is, of course, necessary for the ANC in general, and the Zuma faction in particular, to pretend they are concerned about the unequal distribution of wealth and the wretched condition of the working class, since the “Freedom Charter” which the ANC adopted as their programme in the mid-1950s promised equitable distribution of wealth. This was to be achieved by nationalisation of the mines, banks, monopoly industry and land. These demands have been revived by ANC’s political enemies such as the “Economic Freedom Fighters” who are now a force in parliament, and demand their implementation. Inequality in SA is more or less the same as it was at the end of apartheid. By some measures it is worse. The top 5% in 2016 earned 43% of the total income whereas under apartheid in 1993 they earned 38% . 47% of South Africans live below the national poverty line of $43 per month. The number of people living on less than $1 a day has doubled from 2 million in 1994 to 4 million in 2006. Unemployment, which underlies these figures is now 27%, which amounts to 8.3 million people without a job. Youth unemployment is 50% . Only 6 million people pay tax and there are now 17 million South Africans receiving social grants to survive ; this out of a population of 50.7 million means a third of the population lives on state handouts! This is the inequitable distribution of wealth which the ANC has achieved after more than 2 decades in power. The ANC was brought into government to rescue SA capitalism from the chaos into which the apartheid system had led it. But it was brought to power in the interests of SA capitalism as a whole, and SA capitalism as a whole saw such nationalisations, called for in the “Freedom Charter”, as suicidal. Consequently during its 23 years in power the ANC has quietly forgotten the demands of the “Freedom Charter.” Instead it has done the opposite. State assets were privatised, enabling politicians to enrich themselves, whilst government spending was cut and foreign investment encouraged. The ANC has, in fact, rescued SA capitalism. It has achieved the lifting of sanctions, the reintegration of SA into the world economy and flows of foreign investment. It has more than doubled the size of the SA economy and doubled the average growth rates achieved under the apartheid regime. All this has, of course, been achieved through massive exploitation of the working class. The ANC used the struggles of the working class to propel itself into power. Some of the richest men now in government controlled major trade unions themselves and manipulated workers’ struggles using workers as foot soldiers in the battle with the apartheid regime. The alliance of the African nationalists with the African workers, which existed in the struggle against apartheid, was always a deception. The present Deputy President, Cyril Ramaphosa is a typical example. He was leader of the National Union of Mineworkers (NUM) and led strikes in the apartheid era. Once power was achieved he converted himself into a major shareholder in the platinum miner Lonmin. Lonmin, we should remember, not only exploits miners but shoots them when they strike for increases in pay as at their Marikana mine. Once the ANC achieved power it was exploitation as before for the workers who had helped them into office. Generally the ANC rule has elevated a narrow echelon of ANC leaders and politicians into the ranks of leading South African capitalists while betraying all its promises to the working class. The ANC government is simply the guarantor of capitalist order. Subjection of the SA working class to the bourgeois nationalist forces of the ANC has been a tragic mistake for which the price is now being paid in sweat and blood. The justification for such a subjection put forward by Stalinists and Trotskyists is now totally discredited. We have shown in previous texts how all the arguments they advanced were based on a view that the national bourgeois struggle was progressive and workers should support it . The SA developments since 1994 have illustrated the disastrous consequences of support for the nationalist struggle. The most dramatic example of the bourgeois nature of the ANC and its attitude to the working class was the massacre of 34 striking miners at the Marikana platinum mine in August 2012 . The miners were demanding a tripling of wages which the capitalists considered quite unacceptable so the police were sent in to gun them down. This event, more than any other, shows beyond all doubt which side of the class divide the ANC and its henchmen in the tripartite alliance, the SACP and COSATU, are on. Such an event cannot be swept under the carpet as the ANC has tried to do. Many have understood its meaning and defections from the ANC and COSATU have occurred. Workers themselves have created new unions not politically aligned to the ANC and not affiliated to COSATU. In addition they have recently set up an alternative union federation. The National Union of Metal Workers (Numsa) which joined striking platinum miners in their strike in 2014  refused to support the ANC in the 2014 election and has threatened to set up a new political party to oppose the ANC. It also called for the implementation of the “Freedom Charter.” This was seen by COSATU as an attempt to undermine the tripartite alliance and consequently the management of SA capitalism. Although Numsa was the biggest union in COSATU it was subsequently expelled from the federation. Numsa has since become the core of a new union federation, the South African Federation of Trade Unions (SAFTU) which was set up and registered in March this year. It is independent of the ANC and was set with leading members of COSATU defecting to it. So far 21 unions have affiliated to it. SAFTU press release describes the latest sacking of Gordhan and the downgrading of SA debt to junk as evidence that SA is turning into a “failed kleptocratic state.” It threatens a protest movement against the Zuma regime consisting of a challenge to Zuma in the courts for not upholding the constitution and, if necessary, a general strike. All this is, of course, within the SA legal system and the “Labour Relations Act” of 1995 enacted by the ANC. Like labour relations legislation in most capitalist countries this act makes striking difficult and stipulates procedures which must be followed and also makes workers liable for dismissal and prosecution if these procedures are not followed. These developments show that although workers are understanding the nature of the ANC and the existing trade unions and parties which have cooperated with the ANC they are taking the path of demanding the implementation of the “Freedom Charter” and the setting up of alternative unions. From the point of view of a real transformation of society workers’ experience in the central capitalist countries have shown both these projects as leading to dead ends. The “Freedom Charter”  which calls for sweeping nationalisations is a call for state capitalism not socialism. The system which existed in the Soviet Union was falsely described as socialism whereas it was in reality state capitalism. Socialism can only be created with the abolition of wage labour and ending of the means of production taking the form of capital. The means of production need to be socialised, converted into social property, in a free association of producers producing for human needs. The system needs to be controlled by workers councils with revocable delegates. Nationalisation represents the transferring of the ownership of capital from one set of persons to those controlling the state and does not in any way affect the relationship of the workers to the means of production. This relationship remains one of labour to capital. What is somewhat ironic about this demand, is that those organisations now raising it admit that the SA state is controlled by a gang of criminals who not only thieve from the state but shoot workers when they demand increases in their wages as at Marikana. How having a pack of thieves and murderers in control of the entire economy would benefit workers takes some explaining. Although the new trade unions are not affiliated to the ANC and appear to have a certain amount of independence, as we can already see they are still firmly within the framework of SA labour law. SAFTU for example is applying to the authorities under section 77 of the Labour Relations Act for permission to hold a general strike! The new unions will become the negotiators of the sale of labour power just as the unions in the central capitalist countries. This role will inevitably cause them to become tools of capital. This is because any permanent organisation of the working class can only negotiate the sale of labour power. Working for better conditions within the present system of wage labour entails recognising the logic of the system. This is to recognise the need for profit and hence the exploitation of workers to produce this profit. The section of capitalism in which the unions operate should therefore become more profitable so that more crumbs can fall to the workers. The unions thus become defenders of the national capital and defend its need for increased efficiency, competitiveness etc. The alternative is wildcat strikes outside union and the bourgeois legal framework controlled by workers themselves via mass meetings and strike committees. The key to success is extension of strikes to other sectors. These are the very things which the state legislation prevents and the new unions are complying with. That need seems all the more pressing as this rotting capitalist society’s contradictions deepen. Reported in Financial Times 21/11/16. Mathegka’s book is entitled “When Zuma Goes”. Leibbrand, M; Finn & Woolard (2012). "Describing and decomposing post-apartheid income inequality in South Africa". Development in Southern Africa. 1. 29: 19–34. doi:_10.1080/0376835x.2012.645639_. Drafted by the Stalinist so-called Communist Party of South Africa.